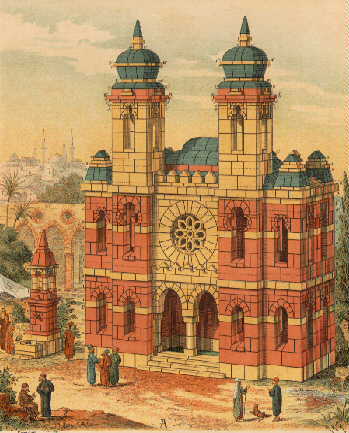 The building on the left is a "Synagogue and Well in Moorish style" from the April 1888 plan book for set GK-AF # 21A (23, later 25). The "giant" step, from 21 to 23 (25), was due the the very large supplement set (of 722 stones) from set # 21 to set # 23. 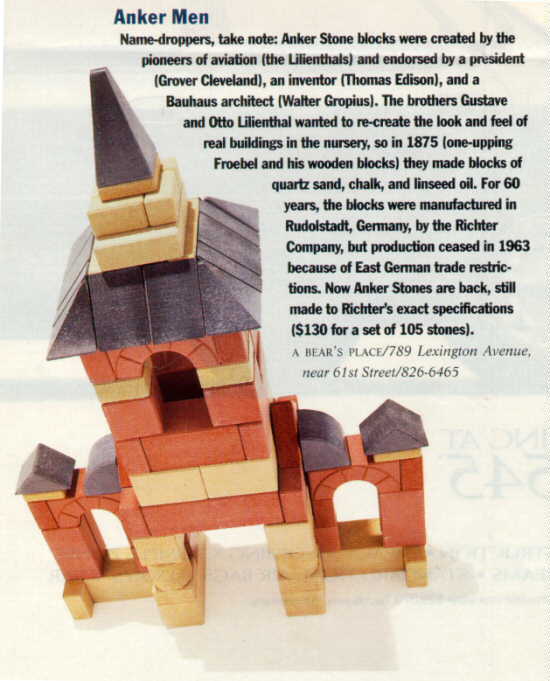 Richter felt that this large supplement set was a marketing mistake, so he "promoted" the set # 23 to # 25 and divided the large supplement set (# 21A) in two -- resulting in a new set # 21A (347 stones) and a new set # 23A (383 stones). The German telegraph identification words were changed also, but in other languages no differentiation between the larger and smaller set # 21A was made, although which set # 23 one owned was clearly identified by all new telegraph words and the old # 23 telegraph words were assigned to set # 25. Confused? Well, don't be. This example is one of the more straightforward examples of the confusion of numbers and names found throughout the history of Anchor Stone Building Sets. Sometimes the confusion was deliberate -- like the reassignment of the telegraph word "Italien" from set # 23 to set # 25; at other times it was an oversight -- like the failure to provide new non-German telegraph words to the new set # 21A. As always, with Richter, newer was better, and so the two new supplement set supplied 730 stones, a "bonus" of eight stones. After this mistake Richter maintained the supplement set sets quite uniform in size, while offering double, triple and quadruple layer supplement sets for those with the money and the desire. Sets are being produced again! Their quality is high. I urge people interested in starting Anchor building, and those who want to provide their educational benefits to their children, to consider buying these new sets. The advertisement to the left (or above, if you are using 640 x 480 resolution on your monitor) is from "Best Bets - The best of all possible things to (buy) in the best of all possible cities" in the April 7th issue of the New York magazine, page 53. For the month of May, 1997. You are visitor number to the Club of Anchor Friends' home page since the posting date of . From the first appearance of the Anchor home page, August 30, 1996, there has been a slow but steady increase in the number of people accessing it. Over the previous eight months there have been about 1,700 visitors, with about 310 during April. This revision is the tenth one that has been on the net. (My first effort was up only four days, when I learned how to display graphics.) The Date and Time is . I plan to update this site monthly. It was last updated on .